Now the serpent was more crafty than any other wild animal that the Lord God had made. He said to the woman, “Did God say, ‘You shall not eat from any tree in the garden’?” 2 The woman said to the serpent, “We may eat of the fruit of the trees in the garden; 3 but God said, ‘You shall not eat of the fruit of the tree that is in the middle of the garden, nor shall you touch it, or you shall die.’” 4 But the serpent said to the woman, “You will not die; 5 for God knows that when you eat of it your eyes will be opened, and you will be like God, knowing good and evil.” 6 So when the woman saw that the tree was good for food, and that it was a delight to the eyes, and that the tree was to be desired to make one wise, she took of its fruit and ate; and she also gave some to her husband, who was with her, and he ate. 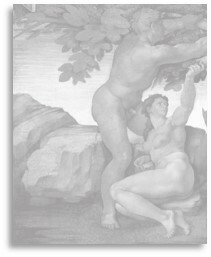 7 Then the eyes of both were opened, and they knew that they were naked; and they sewed fig leaves together and made loincloths for themselves. 22 Then the Lord God said, “See, the man has become like one of us, knowing good and evil; and now, he might reach out his hand and take also from the tree of life, and eat, and live forever”— 23 therefore the Lord God sent him forth from the garden of Eden, to till the ground from which he was taken. 24 He drove out the man; and at the east of the garden of Eden he placed the cherubim, and a sword flaming and turning to guard the way to the tree of life. 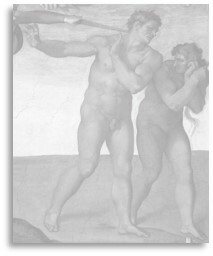 Michelangelo’s scene in the Sistine Chapel of the temptation and expulsion of the First Couple from Eden follows the mythic narrative of Genesis 3 fairly closely – except perhaps for their depiction as meaty white Europeans. But we can forgive the artist for creating in his own likeness, as we all tend to do that. Myths of creation and of how we humans found ourselves in, or brought about, our present predicament are widespread among the world cultures. Typically things start off in a paradisaical state and then some act of ignorance, stupidity, or disobedience breaks the spell and we find ourselves on the outs. The orthodox Christian interpretation has long taken this as historical, which soon enough ran up against the findings of anthropology and evolutionary science. The Church authorities made the mistake of insisting on the literal-historical meaning of this and other biblical myths, making it today impossible for an orthodox Christian to also be a well-informed and reality-oriented world citizen. If the Bible isn’t telling the literal truth, they worry, then nothing in it can be trusted. If the story of our expulsion from the garden didn’t really happen, then why do we need to be saved? Finally, if the Bible is the “word of God” but turns out to be more myth than history, then what the hell … and heaven, for that matter?! There is a way to understand this Bible story without having to reject science, logic, and common sense. But it requires that we loosen up on our insistence that truth can only be literal. It can also be metaphorical, referring to the way a word, scene, or entire story reveals a mystery that can only be experienced, not explained. When you read or hear such a story not as an explanation of prehistorical facts but rather as a veil drawn aside on your own human experience, that is truth in another sense. So how does the Genesis story show us what’s really going on, about what’s true of our human experience? Let’s take a closer look. Serpents make appearances in many world myths and their metaphorical meaning will be different depending on the cultural and historical context. They might represent the principle of time, in the way they slither in lines and shed their skin to be reborn. There’s probably an acquired reflex deep in our hominid genes that jumps at snakes but reveres their lethal power. To observe a slithering serpent as a “traveling esophagus” (Joseph Campbell) is to identify it with the most elementary of survival drives. We know from science that our body is not a spontaneous and unique expression of biology, but instead has genetic roots deep in life’s adventure on Earth. Over many millions of years this organism and its nervous system evolved by seeking out niches of nourishment, safety, mastery, and procreation. 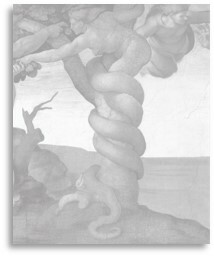 These are the survival drives of our animal nature, represented by a serpent in the Genesis myth. When we are young children, our own animal nature and its survival drives compels behavior that inevitably runs up against the ‘dos’ and ‘don’ts’ of morality, that is to say, of the rule system that lays down the code of what sorts of behavior are commanded or prohibited. Because our animal nature has been at it for millions of years already, it takes time and repeated disciplinary actions for our tribe to bring these impulses in line. In those early years when our animal nature is ‘tempting’ us to cheat, lie, and manipulate others for what we need, our sense of right and wrong is contained by what we might call a morality of obedience. It’s not necessary that we understand why some action is right or wrong, only that we obey the rule that tells us how to behave. Our taller powers said it, they call the shots, and we must do as they say. When we obey there might be a reward, but more certain still is the penalty (both physical and emotional) that follows our disobedience. The psychological consequence of disobedience is called a guilty conscience. Part of growing into a mature adult involves breaking free of this morality of obedience where our behavior is motivated by external incentives. While it’s a social necessity that the animal natures of children are brought into compliance with the rule system of the tribe, adults are expected to take responsibility for their own lives and behavior. In one sense, it’s nice to have everything laid out for us, with all the “shalts” and “nots,” lollipops and paddles at the ready. But our adult experience is not so simplistic or clear-cut. We need to accept the full burden of our existence along with its unresolved, and in many cases unresolvable, ambiguity. To merely “trust and obey,” as the orthodox hymn goes, would be to refuse the responsibility of being an adult. It becomes imperative, then, that we shift from a morality of obedience to an ethic of responsibility. There will be times when our own higher adult self sees the inherent egoism of obedience – doing something for a reward, refraining to avoid punishment, thinking all the while “what’s in it for me?” In the adult world more variables have to be considered, differing perspectives allowed, and in some cases doing the right thing puts us in conflict with the morality of our tribe. We need to be willing to bear some conscientious guilt by departing from the norm or disobeying a rule when these are enforcing oppression, exploitation, and privilege.